Mr. Logan describes the X Image Extension and show us how to use it—for the experienced C programmer. Mr. Hartley shows how to do interactive 3-D programming using Open Inventor, Release 2, which he used to create the images on our cover. This article describes the process of porting a variety of audio applications from the SGI platform to the Linux operating system. A look at a new tool for visualizations of scientific data—VTK, an object-oriented visual toolkit. 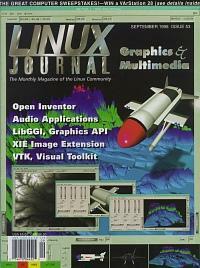 Are you hesitant about porting your favorite VGA MS-DOS program to Linux? Using this tutorial and SVGALIB, porting will truly become a matter of minutes. Article about using Differential X Protocol Compression which compresses X messages up to over 7:1. Once there was a time when chess software for the home was slow, weak and expensive. To find human opponents, you had to go to your local chess club. Today, the situations is different. We continue with our look at converting an office from a commercial operating system to Linux. USENIX 1998 SSC's system administrator travels to New Orleans and actually returns to tell us about it. A Little Devil Called tr Here's a useful command for translating or deleting characters in a file. Driving One's Own Audio Device In this article Alessandro will show the design and implementation of a custom audio device, paying particular attention to the software driver. The driver, as usual, is developed as a kernel module. Even though Linux 2.2 will be out by the time you read this, the software described here works only with Linux-2.0 and the first few decades of 2.1 versions. MUP: Music Publisher Here's a look at notation editors for producing sheet music under Linux.